The lights shine bright in Las Vegas! Las Vegas - one of the most illuminated cities in the world - hosted 600 exhibitors and close to 40,000 attendees at this year’s LIGHTFAIR International Trade Show and Conference held June 3-5.
ebm-papst showcased active cooling solutions for a variety of lighting markets. Innovators as Pathway Lighting, LF Illumination, Alterlume, Spectrum Lighting, NBL, Atlantic Lighting and Century LED provided examples of our contract manufacturing capabilities. 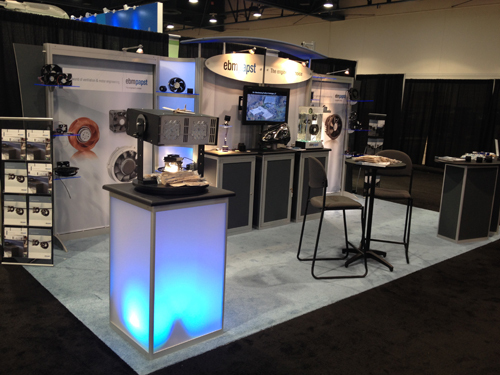 We displayed a wide array of fans including our radial impellers, axial fans and FlatPak blowers. More than 1,000 attendees visited our booth, seeking reliability and long life span, ingress protection and energy efficiency in the systems that cool their lighting applications. The ebm-papst team demonstrated how our products exceed expectations for all three criteria. Visitors were also impressed with our industry leading 7 decibel active solution for high powered light engines produced by Xicato, CREE, Bridgelux, Philips and other- LED OEMs. Talking about trends, this year’s show reinforced what we’re already seeing in the marketplace: Light Emitting Diode (LED) technology will become the norm for virtually every light fixture over the next decade. Our active cooling solutions, which dissipate heat directly from the core of LED modules, are becoming more and more popular for high-powered LED lamps used in concert halls, museums, places of worship - as well as retail and architectural venues. Technology is also improving for LED drivers, which regulate the level of power to an LED or string of LEDs based on changing energy demands and operating environments. Want more information on the cooling solutions ebm-papst can offer your high-tech, high heat lighting applications? Visit the SSL/LED lighting section in our Market Solutions Tool! To learn more, please contact Steve Berestecky at ebm-papst Inc.